Leukaemia is a cancer that affects the white blood cells. These cells fight infection and help to protect the body against disease. There are number of different sub-types of leukaemia, classification of which depends on which cells are affected, at what stage in their development the problem occurs and how quickly the cancer spreads. In children, acute leukaemias are seen most frequently and develop very quickly. The most common, Acute lymphoblastic leukaemia (ALL), affects around 400 children in the UK every year. Children with ALL produce too many immature white blood cells in their bone marrow. Due to their immaturity they can't fight or prevent infection. These cells also crowd out normal blood cell production leading to anaemia and easy bruising and bleeding. Until the 1960's, ALL was almost universally fatal within weeks. Since then, ALL treatment advances in children have been one of the great success stories of modern medicine and now as many as 98% can expect to achieve an intitial remission with between 80-90% going on to be cured. It comes at a cost though, the treatment can be brutal, lasts for years and leaves many with lifelong side effects. The search goes on for less toxic treatments. In spite of all the advances however, around 20% of children who achieve an initial remission will see their leukaemia come back (relapse). ALL that relapses is often much more resistant to standard chemotherapy, especially if it comes back whilst still on treatment, known as an early relapse. At that point a stem cell transplant may be considered if 2nd line chemotherapy can achieve another remission. A stem cell transplant starts with extremely high doses of chemotherapy and radiotherapy with the aim of killing all the stem cells in the bone marrow and then replacing them with stem cells from a matched donor so that a new immune system can develop, free of disease. Whilst stem cell transplant remains the strongest treatment available, new advances harnessing the immune system are showing great promise in some areas of cancer treatment, including certain types of leukaemia. 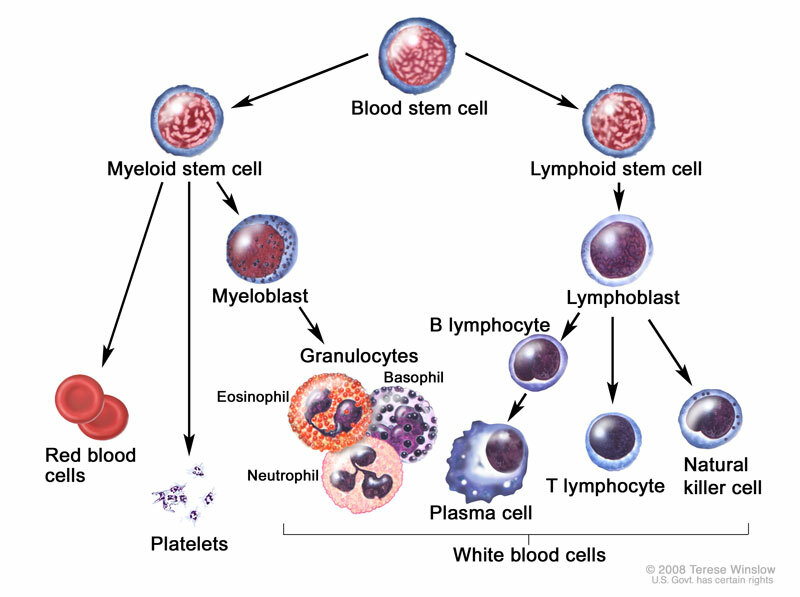 ALL originates in the lymphoblasts in the bone marrow and affects either the T-cells (T-ALL) or the B-cells (B-ALL). The B-cells are involved with producing antibodies and assist in activating T-cells. Although there are a few different types of T-cells their function broadly is to attack viruses and tumours and other damaged cells. Diagram showing the formation of differing components of blood. T-ALL is the less common type, accounting for around 15% of ALL cases in children. It has an important sub-type, ETP-ALL, which can be more resistant to chemotherapy. It is more frequently necessary to treat T-ALL as a high risk leukaemia than B-ALL meaning the most intensive chemotherapy regimens are used. With modern treatment according to risk, outcomes have improved for T-ALL and cure rates are not far behind those of B-ALL. However, if T-ALL relapses, as still happens in 20% of children, the prognosis is significantly worse. Of the children that relapse, only around 20% can then be cured. Treatment advances for T-ALL are lagging significantly behind other leukaemias. Very few of the new immunotherapy type treatments being trialled can be used for T-ALL because they mostly rely on directing T-cells to attack other targets. We currently can't get T-cells to attack malignant T-cells because they can't tell the difference between them. Very early stage trials that hope to overcome this problem are underway which we will follow with interest. Further into the future, it is possible that new gene editing techniques, such as CRISPR-CAS9, will be able to edit the faulty genes and 'switch off' the cancer but a tremendous amount of work remains to be done. More research is urgently needed and Team Lewis Trust has been setup with the charitable objective of raising funds to contribute to this research.